How to Qualify for Boston Marathon? 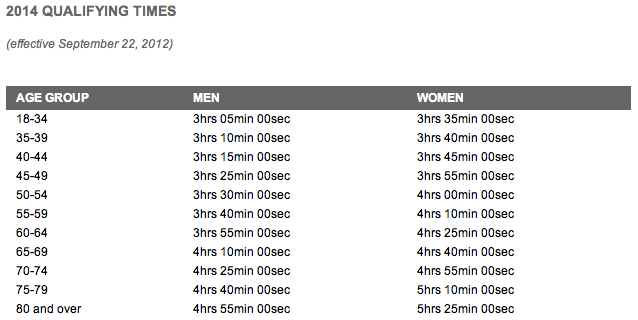 The current qualifying for Boston Marathon in the 18-34 Age Group is 3hrs 05mins for Men. This means I would have to run at a speed of 4min 23sec/km throughout the entire marathon. To run a very even marathon is pretty impossible given differences in elevation along the course and fatigue setting in. In order to meet this 4min 23sec/km pacing, I have planned break my PB on three major distances starting with a SUB40 10km this year, followed by a SUB1hr30 21km in 2014, SUB4hr FM in 2015, SUB3hr30 FM in 2016. I definitely think these are achievable goals if the work is put in.